We so often think of Koigu’s Kersti as the perfect sweater yarn. It knits up beautifully at 5 stitches to the inch and makes for a sweater you can wear year-round. 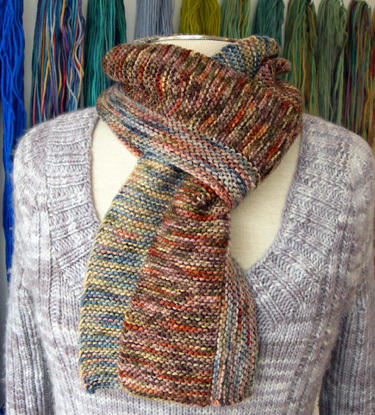 However, Kersti’s good for more than sweaters, as Kathy showed us with her recently completed scarf. Knit with 3 complementary colors and in garter stitch, it’s a great way to get some color in your wardrobe. Cast on 18 stitches with Color A. Slipping the first stitch of every row as if to knit, knit every row for 30 inches. Change to Color B and knit every row for 30 inches. With Color C, pick up and knit one stitch in every ridge of the side edge of the scarf. Knit every row for 15 rows. Bind off. thanks for the pattern. now to buy more Kersti. my girls love this yarn….so soft. LOVE the scarf! which 3 colors are used in the photo? I must be over thinking the pattern when I read it–I just can’t picture what to do with color C! I am trying to imagine it in my mind and I just can’t! Please help me. Thanks. Jill, just turn the scarf 90 degrees and with color C pick up stitches along the long side of the piece you just knit. You need to pick up one stitch for every ridge – each ridge is made up of two rows. Hope that helps!